Japan continued to dominate the Asia Rugby scene with an impressive 57-17 win over Hong Kong in Tokyo last Saturday May 28, in the Asia Rugby Championship 2016. With convincing wins both at home and away against Hong Kong and South Korea they top the table with 20 points and a devastating 219 points difference from the 4 match series. Hong Kong lie second in the table with 5 points after their 34-27 last minute try win over Korea in Incheon on May 14, leaving Korea lying bottom on 2 points. This week’s match in Hong Kong between Hong Kong and South Korea (June 4) is still important as it will decide the runners up and wooden spoon positions in the competition. In Tokyo, Hong Kong started strongly, taking an early lead, through a Ben Rimene penalty and an Adrian Griffiths try, converted by Rimene to put Hong Kong ahead 10-0 after 20 minutes. After fielding a young team to defeat Korea 60-3 the previous week, Japan made many changes for their match against Hong Kong, including bringing back their top play makers Tevita Tatafu and Ryuji Noguchi. However, Japan were a little disjointed in the early stages and Hong Kong captialised on Japan’s mistakes, as well as producing some good attacking moves, including Rown Varty putting Adrian Griffiths over for the try. But Japan responded just a few minutes later through lock Naohiro Kotaki, and added to the score with tries by centre Takuya Ishibasi and winger Ataata Moeakiola. Ryoto Nakamura converted each of the tries and kicked a penalty from close to the half way line to give Japan a 24-10 lead at the break. Hiroki Yamamot scored for Japan 2 minutes into the second half and Hong Kong responded when Rimene and Ryan Meacheam put James Cunningham over to score, both were successfully converted maintaining the 14 point gap (31-17). But from then on it was all Japan with a succession of tries by Ishibashi, Doga Maeda and Moeakiola followed by the award of a penalty try. 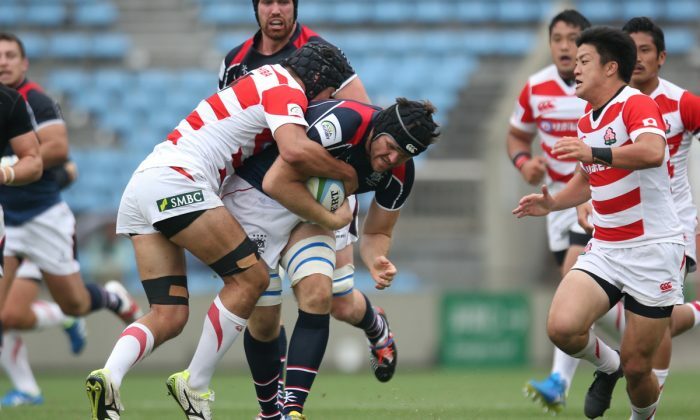 Nakamura finished with five conversions and 3 penalties for a personal tally of 19 points in the 57-17 win. The final match of the Championship at the Hong Kong Football Club this Saturday June 4 will see Hong Kong take on South Korea in a decider for second place.